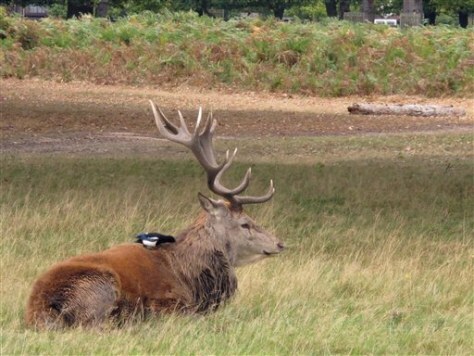 A stag rests in a field at Bushy Park about 13 miles southwest of central London, on Wednesday. For much of the past week this massive, short-tempered stag has been charging into British headlines, goring a man in the middle of a picnic and chasing one woman through the bracken. The stag's rampage has cast a faint shadow of fear over Bushy Park, a quiet suburban expanse of tree-lined avenues and water features popular with retirees and stroller-pushing mothers.